In most cases, you WILL NOT make money online fast or generate a six figure income from your blogging efforts. If you’re looking for tips on how to make money online fast or “get rich quick” strategies, you’ve come to the wrong place. I refuse to “bamboozle” you or fool you with a bunch of slimy marketing or make you promises I can’t keep. I have this crazy obsession with being able to sleep well at night. What I WILL DO though is share the real key secrets for making money online. The super secret reality of how to be successful online and how to earn money while you sleep. Surprised? Think I mislead you? Well, okay, maybe a little. These are pure common sense right? The same basic concepts your parents taught you growing up. But they truly are the “secret sauce” for being successful and earning money online. Just ask any reputable blogger or online marketer. See, many people are always looking for the easy way out. The quick way to earn loads of money. The slimy internet marketing types know this, and they create stuff just so you find them and pay them. You know who earns loads of money with those schemes? Certainly not you, but generally the slimy internet marketing types. Those types are laughing all the way to the bank. See, the funny thing about an online business, is that they are really no different than any other type of business and the principles and strategies for being successful aren’t either. There are differences of course, but the foundational elements are exactly the same. This is a big one. For some reason, which I cannot for the life of me figure out, there seems to be this idea that you can head over to Blogger, spend 5 minutes creating a blog, write a few articles about what you ate yesterday and how you played with your kids in the yard and begin earning money a few days later. Yes, my example is a bit far fetched, but you would be really surprised at the number of emails I receive from people asking me why their blog isn’t earning any money. I head over, look at their blog and immediately realize why – they’re content isn’t good, too short and provides no value. I respond by them telling them exactly what I just said. Harsh? Perhaps, but I believe in being honest and anything less is just misleading people. Think about it this way, pay money for a few articles written by a writer you’ve never heard of that talks about what they ate yesterday and how they played with their kids? Of course not. To make money blogging, you have to work hard. On average, I spend roughly 15-20 hours a week on my side business which includes running my blogs, niche sites and services business. That’s in addition to my full-time job, which generally taks up another 45-50 hours of my time a week. During that 15-20 hours, I’m focused (most of the time). I’m designing and building sites for my clients and creating content. The more time and effort you put into your blog, the faster it will grow and the more money you will make. Related to this is not spending your time doing the things that really matter. Social media is a huge distraction for me, and something I really have to manage. Hard work does not mean spending all of your blogging time on Google+, Facebook or Twitter. Hard work doesn’t mean spending all of your time tweaking the design of your blog. Hard means finding a balance of all of these things, and at the end of every day having delivering the highest quality content you can. Why do I ask this? Remember, the topic you choose to blog on will be a topic you’ll be writing about often and for a long time. If you aren’t passionate about that topic, it will show in your writing and even worse, blogging will become just another job and you’ll slowly begin to hate it. BUT, if you blog on a topic you love and that you’re truly passionate about, you’ll enjoy it, look forward to it and have more ideas to write about than you have time. A great problem to have. 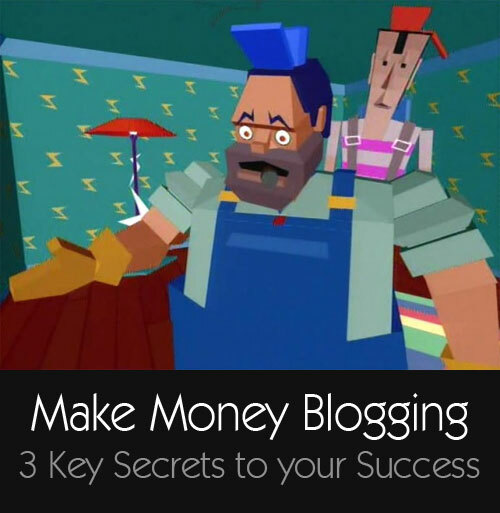 To make money blogging, you must be dedicated. You need to realize that you’ll need to write, at least once a week for 6-12 months before you’ll start to see any reasonable income and growth. Your focus must be creating very high quality content. I would venture to say that 90% of your blogging time should be used to create content. The remaining 10% should be used for other activities such as social media and tweaking your blog design. Far better to have an ugly blog with great content, than a beautiful blog with bad content. Unfortunately, there are tons of blogs on the internet that have gorgeous designs, but the content is just terrible. One last thing – I see SO many passionate people start blogs. These people are on fire when they do, and it’s a great thing to see. They publish 2-3 articles a day, send me emails about how excited they are and how they can’t wait to start earning an income. Then, a month later, they just stop. That blog they were so passionate about 4 weeks ago is dead. I met someone like this in October of last year. He even wrote an article that I published here on Side Income Blogging. We chatted via email almost everyday for a few weeks, then he just suddenly disappeared. The blog is still up, and hasn’t been updated since October of last year. Such a shame. Why does this happen? Well, their are lots of reasons but the main one is that people underestimate how much work goes into running a blog. The other reason is they get frustrated because they are spending so much time on their blog, and nobody is reading it. Why write when nobody is reading right? People will read. See, you have to stay with it, you have to be dedicated, you have to be passionate enough to keep writing even when you think nobody is reading, because people will read it. All of that content you are writing is being slowly indexed and ranked by Google and other search engines. Once your blog has enough content and credibility with Google, Google will slowly start to rank your content higher in the search engine results pages (SERPs) and people will start to click through. If you’re content is great, those people will subscribe to your blog and promote your content to other people and then those people will do the same and so on. Then, one day, you’ll check your blog’s traffic in Google Analytics, thinking to yourself, “Why am I even doing this, it’s just going to that small handful of hits I usually get.” When you login, you’ll see this huge spike and you’ll get this wonderful feeling of excitement. I’ve been there, I know. This will happen for you, if you are dedicated, stay the course and write great content that people need. The amount of time varies for everyone, but it will happen. I’ve seen it far too many times, both for myself and for my clients. When I first started, I was a web designer and developer (it’s what I do in my full-time job), but I most certainly wasn’t a writer, a marketer or public relations person. Heck, some of you might even argue that I’m not much of a writer now, and frankly I’d agree with you. Writing is not a key strength for me and is something I work very hard on. I constantly educate myself on how to be a better writer by reading eBooks, and blogs about writing. I also read many other blogs and pay attention to their writing style. I’m also not a marketer, but have really learned a great deal about online marketing from people that are. My point with all of this is that constant education will be required in order for you to make money online and grow your blog. I learn at least one new thing each and every day, and on most days, I learn far more than that. The internet is full of information and people willing to share their knowledge with you. I’ve found Google+ and Google+ communities to be a great resource for finding knowledgeable and helpful people. Anyone that tells you anything about how to make money blogging that doesn’t include hard work, dedication and education is lying. Trust me on this. I’ve been blogging for more than 6 years and talked with hundreds of successful bloggers. I personally know bloggers that earn 6-figure incomes, and have talked with them. They did it following the 3 basic strategies above. These programs that promise to have you earning six figures in a year, are scams. Sure, people can do it, but most don’t. Remember, some people win the lottery, the majority of us don’t. If you EVER get frustrated or don’t feel motivated about your blog, shoot me an email. I’ll help you out, no charge and absolutely free. I hate to see bloggers give up. You can do this. How do I know? Because I did. Thank you for a blog that is totally spot on for me today. I have been blogging for just over a year and a half and some days I really feel like quitting. Reading your blog made me feel a bit hopeful that if I keep working at it and improving little by little, one day, I’ll get there. Kim, thanks for taking the time to add your comment. Really glad to hear you enjoyed the article and that it was encouraging for you! Thanks for the great content. It really is a long game, but the pay off is worth it.